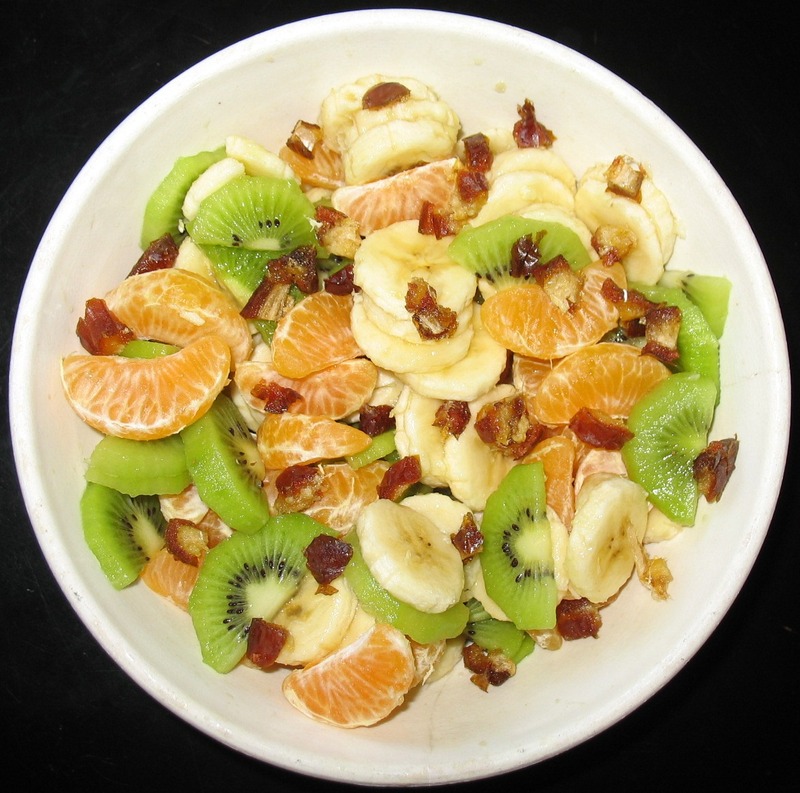 This was the eighteenth day of my raw food challenge. I got about 8 hours of sleep last night but that’s only because the darling Husband took the Girl to the rink. Otherwise it would have been five hours of sleep. Must go to bed earlier tonight. Morning Snack – Um, yeah, I slept in. 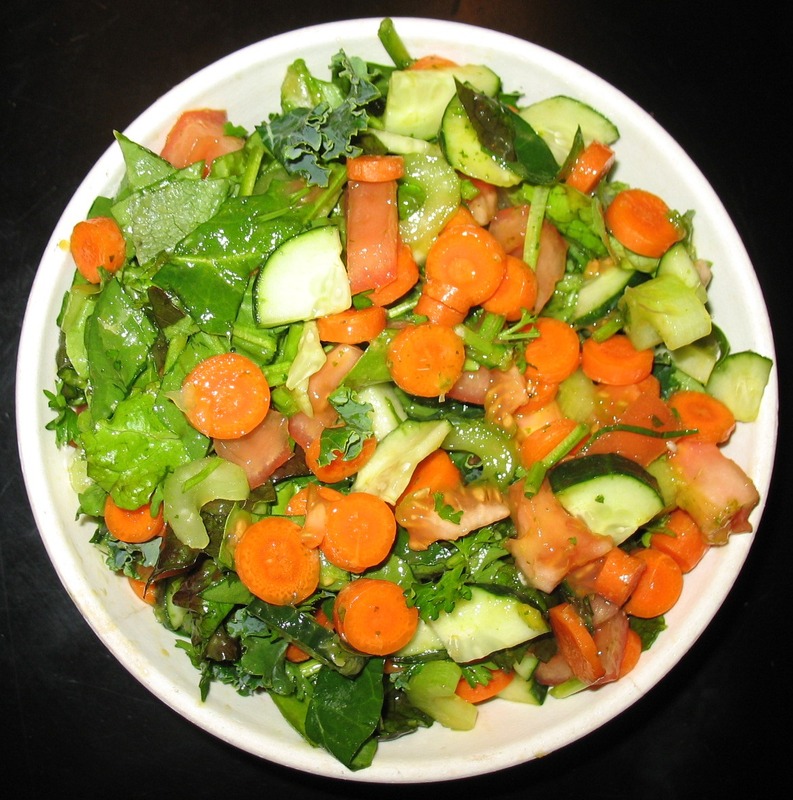 Dinner – Big Salad (2 oz Red Leaf Lettuce, 1 oz Spinach, 0.5 oz Kale, 3 oz Carrots, 1.5 oz Celery, 6 oz Tomato, 2.5 oz Cucumber) with a Dressing made by pureeing 2.5 oz Mango, 1 Clementine & a bit of fresh Cilantro… and then I added 8oz of Apple Juice which I will explain in a bit. 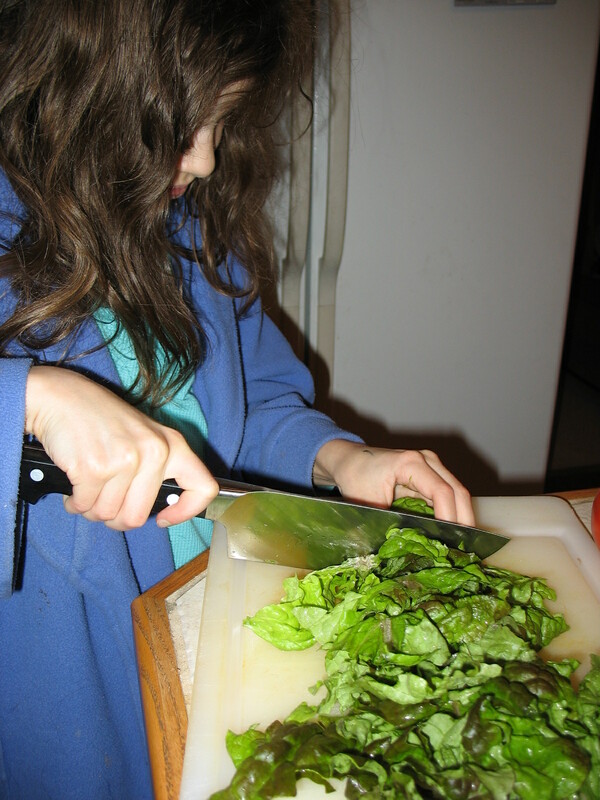 My nine-year-old wanted to help chop up my veggies. Yes, her hair is “no poo” too. Evening Snack – 8 oz Apple Juice, 1.5 servings of dried Pineapple. 60 minute walk on the trail with the Husband (we ran 25 minutes of it). I’ve got 11 weeks before I officially begin half-marathon training. That’s plenty of time to build a solid base of 3-5 miles… provided I take it slow and don’t injure myself. As of Friday I’ve lost 7.4 lbs and 6.6 inches. For more information, check out my Week 2 Summary. There was a problem with dinner. Yes, it tasted terrific. The problem was, I was already way behind in my calorie count before I started eating this meal… and we ate later than usual. I made it about two thirds of the way through that 8 cup salad and realized that it was going to take me an hour to finish it. 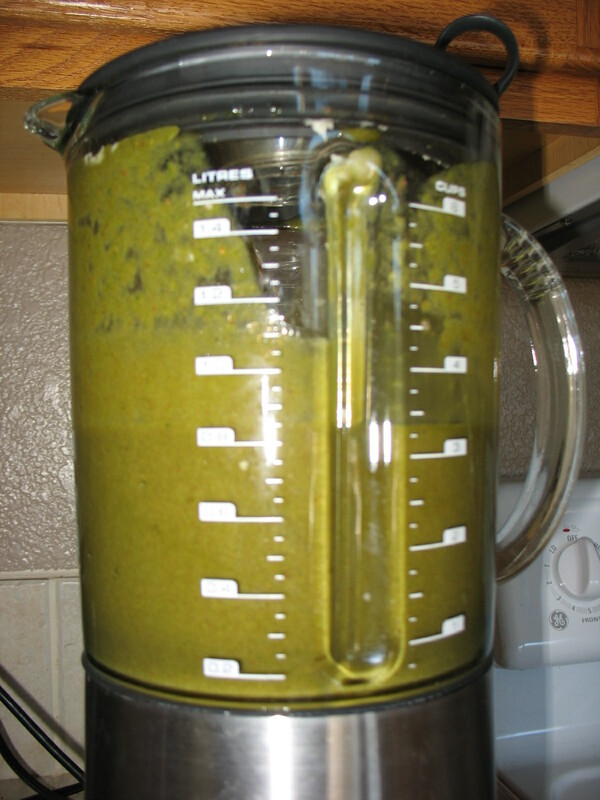 I knew it was only about 250 calories so I threw it into the blender with some apple juice. The texture was a bit weird but I was able to drink it (which went so much faster than chewing it). My calorie count was way too low today. This explains the headache I’ve got right now… it’s a “hunger” headache. I know them quite well from my dieting days. Usually I get really cranky and would even have symptoms of low blood sugar (shaking being one of them) but that wasn’t the case today. Just the headache. I’m guessing my blood sugar is staying relatively stable, which is a nice change. So, what is this pizza-looking-thing in the photo? It’s the Husband’s lunch today. He was making his vegan pizza and jokingly asked if I was going to photograph his lunch too. “What a great idea!” I said. So, here is his delicious meal… well, I can’t vouch for the deliciousness of the vegan cheese (I’ve never tasted it), but his special pizza sauce is freakishly amazing! 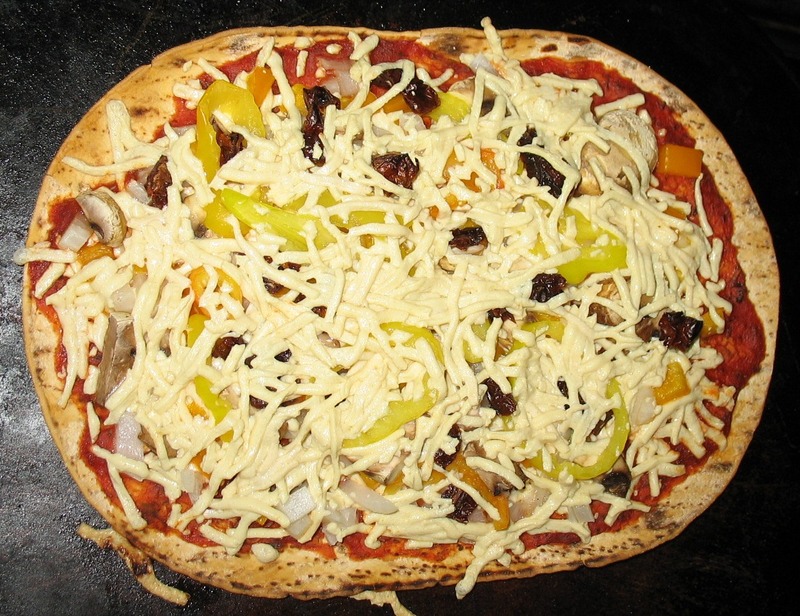 Included toppings are banana peppers, sun-dried tomatoes, red bell pepper, and onion. It smelled marvelous and I was quite happy to take it’s picture. This entry was posted in 30 Raw, Brick Removed, No Shampoo by Jules Lane. Bookmark the permalink. 😦 I can’t see the pic of his amazing dinner 🙂 YOur salad dressing sounded devine though! I think I got the images fixed. The software kept wanting to add them to the three at the top. That dressing is de-lish. I’ve made it before. I do one with pomegranate too that’s yummy.